You're sure to hit a high note and receive rave reviews with these whimsical musical note bookmarks as your event favors. 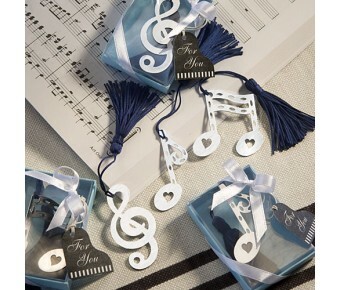 From Fashioncraft's exclusive Book Lovers Collection, the favors are sold in an assortment of three musical notes ranging in size from 5" to 5.5" long (including the tassel) and 1" to 1.75" wide. 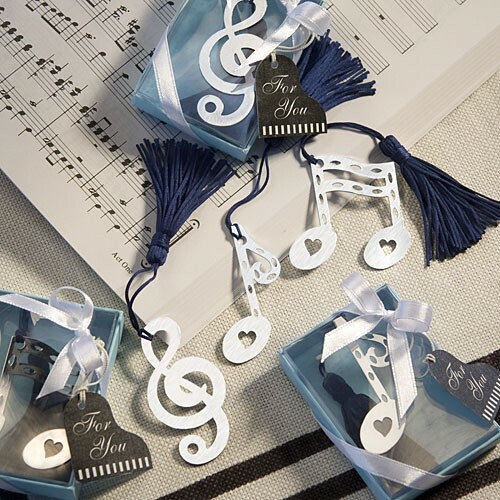 Each favor features a bold silver metal musical note charm with cutout details and an attached blue tassel that peaks out of the book for easy page finding. Destined to make a great impression, each comes packaged in a clear topped box with a teal base, tied with a white satin bow and an attached "For You" tag with a piano themed design. 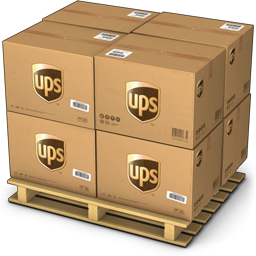 Shipped assorted the price is per piece.